Skyline DKI’s professional recovery team will help throughout the claims process. As a preferred vendor for many agencies, Skyline is familiar with the claims process and will work with residents, agents, and adjustors from beginning to end to ensure a smooth process of restoring your property. One of our trained and experienced crew members will help you file the claim and make sure that it is submitted quickly and correctly. Q: Will my insurance provider cover damages relating to flooding and water damage? It depends on the type of damage. 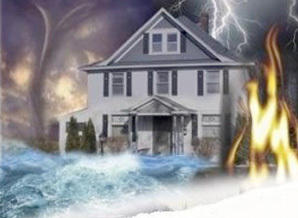 Most insurance providers differentiate between water damage caused by problems such as defective plumbing or roof damage after a storm and flood damage caused by overflowing rivers or over saturated soil. If the damage was caused by, for example, a burst pipe, then most insurance companies will pay for cleanup. On the other hand, if the problem was caused by something like a flooding lake or river, then most companies will only cover it if you have a separate flood insurance policy. Q: Most of my home was destroyed in a fire—will my insurance company pay for recovery costs? Yes, most insurance providers will pay for most or all recovery costs after a property fire. The cause of the fire—whether a cooking fire, electrical fire, or something else—doesn’t matter. Your insurance provider should pay for every aspect of recovery, including property cleaning, water extraction, contents restoration, and reconstruction. Q: I’ve found out that mold is growing throughout my home—will insurance pay for remediation? Each insurance company differs, but whether or not the mold removal services are covered will often depend on the cause of the growth. Mold is almost always caused by moisture—if the moisture is the result of a leaking pipe or other form of defective plumbing, then you shouldn’t have to worry about removal costs. On the other hand, if the mold was caused by, for example, water from an overflowing river entering your basement, then you may have to cover the costs unless you have a flood insurance policy. Q: Will my insurance provider pay for cleanup and reconstruction costs after a major storm? If a severe windstorm damaged your roof and water began to leak in, then insurance will usually pay for the recovery costs. On the other hand, if torrential rains resulted in oversaturated soil and a flooded basement, then you may have to cover the costs. Wind damage, snow damage, ice damage, and some types of rain damage are covered by most insurance providers. Flooding is the main exclusion.